One of Thunder Bay's most popular attractions is actually located about 18 miles west of the city center. But if you like waterfalls or a looking for a good campground, it is worth the slight detour to travel to the village of Kakabeka Falls on Hwy. 11/17. 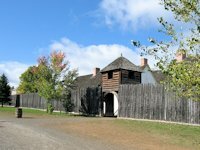 On your return trip back to Thunder Bay, you can take in another Thunder Bay attraction: Fort William Historical Park. 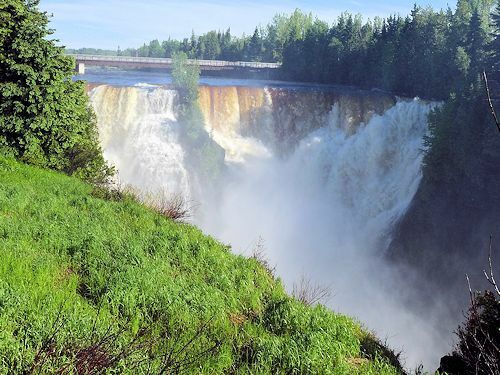 Kakabeka Falls is located 18 miles (32 km) west of Thunder Bay off Canadian Highway 11-17. 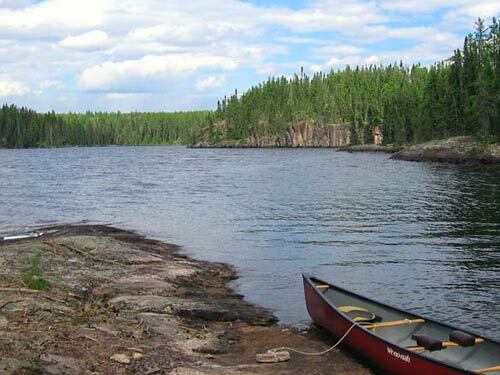 It is on the Kaministiqua River which eventually flows into Lake Superior at Thunder Bay, Ontario. 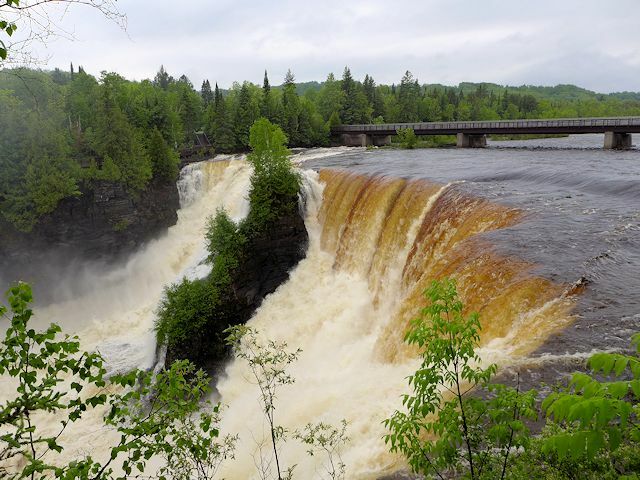 At 138 feet, Kakabeka is the highest waterfall in the Lake Superior basin and for that reason worth taking a slight detour off the main Circle Tour route to see it. From the visitor center parking lot, there's a handicapped accessible hiking boardwalk that gives you a very good view of the falls. Also at falls is Kakabeka Falls Provincial Park. 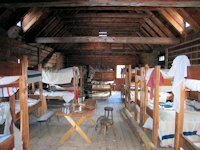 It has a visitor-history center, 5 hiking/walking trails, and 169 campsites (90 with electrical service) with modern washrooms and showers. The village of Kakabeka Falls is less than a mile away so provisions and extra services are handy. 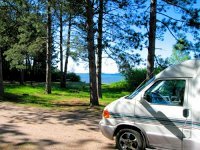 More pictures and info on Kakabeka Falls Provencial Park plus more Camping in Thunder Bay Area. Fort William re-creates the settlement of the North West Company that operated during the voyageur and fur trade era. 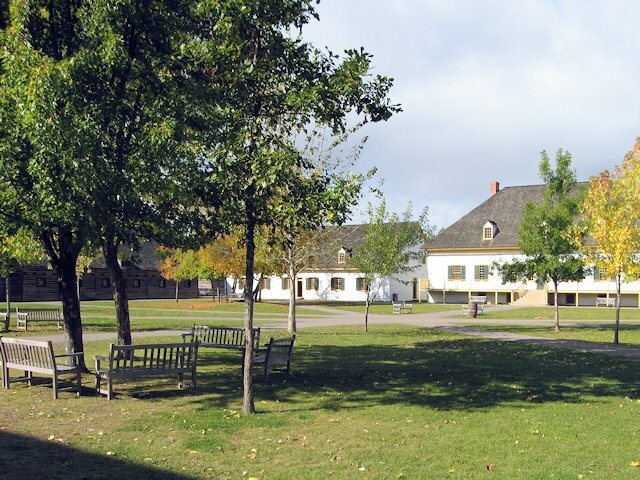 Previously the company had its trading center at Grand Portage on the American side of the Pidgeon River until the British and American conflicts required its relocation to Canadian soil. 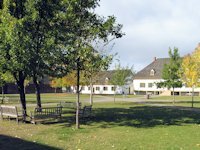 Over 50 buildings are in the fort complex. Costumed guides provide insights into the history of the era and narrations of activities that took place throughout the fort. 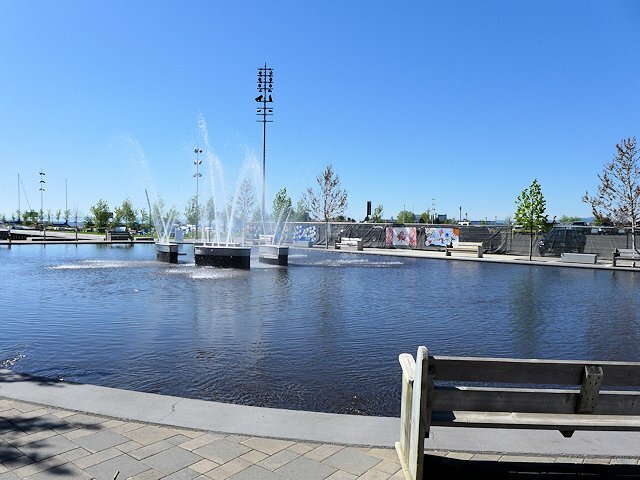 The Current River enters the city from the north and flows into Boulevard Lake. 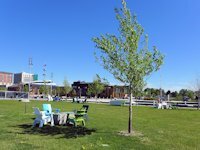 The lake is surrounded by 650 acres of parkland with picnicking facilities and recreational trails sprinkled throughout. 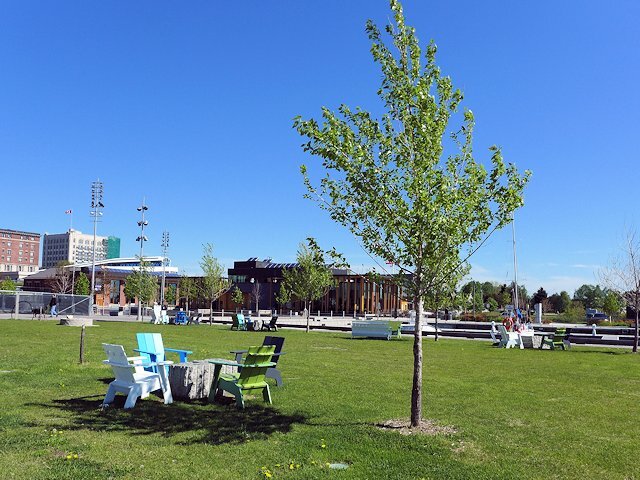 Just upstream from the lake is Centennial Park, with 147 acres located along the shores of the river. The park also features a logging museum, a 1910 style bush camp, and a children's small animal farm. 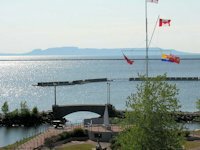 View of the "Sleeping Giant" from Prince Arthur's Landing at Marina Park in Thunder Bay. 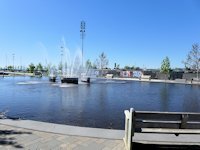 There's a network of walking and biking/jogging trails throughout the park as well as gardens and patios for sitting, visiting with friends, or just enjoying the lake views. 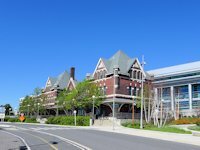 Across the highway from the park is the pagoda of the Thunder Bay Tourism Office with brochures and help on restaurants, lodging, and many things to do in the Thunder Bay area. 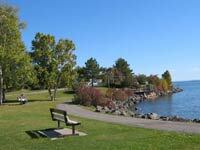 There are three municipal golf courses in Thunder Bay plus a few private courses open to the public. Possibly the top golf course in Thunder Bay is the Whitewater Golf Course situated along the Kaministiqua River. The Canadian Tourism Center on the North side of Thunder Bay on Hwy. 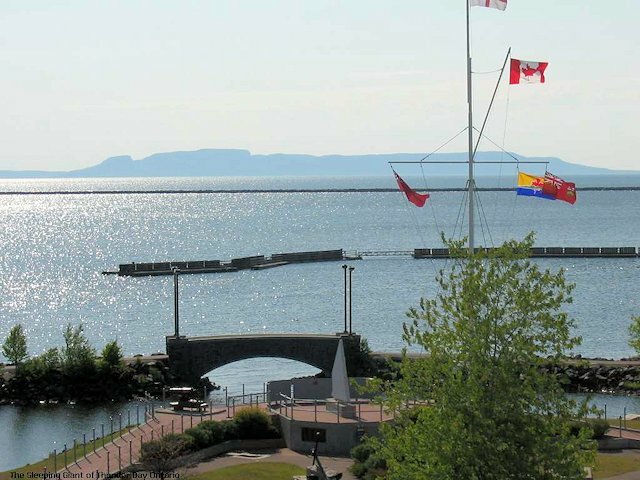 11/17 is a good stop for information on your travels in Canada, a good place for a picnic, and offers scenic overlooks of Thunder Bay and the famed Sleeping Giant of the Sibley Peninsula. 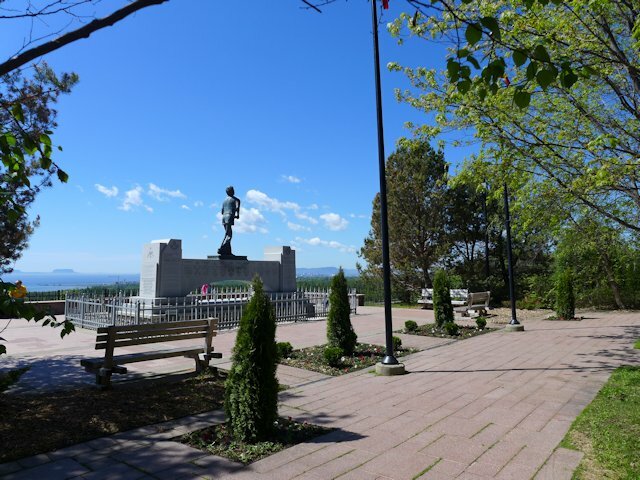 There's also a memorial garden for Terry Fox, a Canadian hero who, though disabled with an artifical leg and stricken with cancer, embarked on a marathon coast to coast run for cancer research. He managed to cover 3,339 miles before the progress of the disease forced him to end his journey near the site of the monument. Continue north of Thunder Bay on Highways 11 & 17. After you pass the junction with Highway 527, the road turns in a more easterly direction. 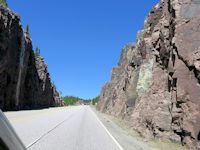 By the way, if you are heading north on 527 towards Armstrong for a canoe or fishing trip in the Wabakimi area, you'll be pleasantly surprised at the quality of the highway surface. 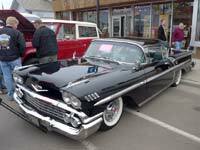 But be sure to fill up on gas in Thunder Bay because there's very few places enroute and Armstrong is a small town. 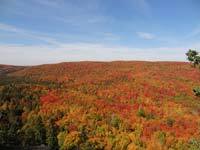 East to Sleeping Giant Park and Nipigon-Red Rock, Ontario. Winter - Sault Ste Marie.